All calls are received at the Crime Stoppers tips line at a Crime Stoppers Answering Service in Canada. 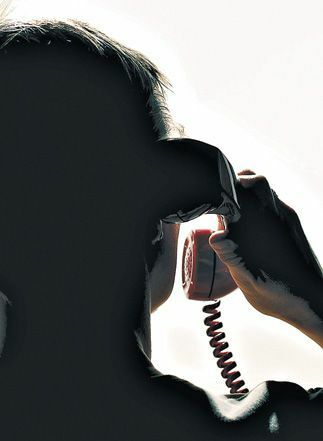 These phone lines are answered 24 hours a day by specially trained Crime Stoppers Operators, all phones are stand alone instruments which DO NOT provide caller ID, and Conversations are not Recorded. The Crime Stoppers Operator receiving the information completes the tips information form, makes initial inquiries and then relays the information to your local Crime Stoppers Coordinator. Communication between the Crime Stoppers Operator in Canada and the Fort Stockton Crime Stoppers Coordinator is all conducted via a special Crime Stoppers program which is only accessable to the Coordinator. Should the Fort Stockton Crime Stoppers Coordinator have any questions regarding the information recieved, we have the very unique integrated Two-Way Dialog capabilties. This allows the tipster to come back and provide additional information to their tip at any time, but also provides secure means for the coordinator to ask questions or provide reward information back to the tipster through the same secure and encrypted interface. The information recieved will be forwarded to an investigating officer, with details only specific to the tip. Calls are accepted regarding any publicized request for information, such as "Crime of the Week" or such other crime(s) the caller has knowledge of. Tipsters now have the option of giving us tips online or by texting a tip. The process is completely secure and anonymous and is a very effective and efficient means of safely communicating with us in today's world. Our WebTip process is powered by the world's leading online tip solution provider, Anderson Software. Texting a tip is another secure and easy way to send your information. 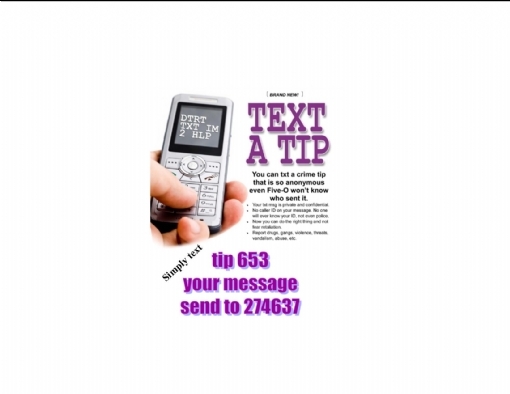 Just text "tip653 along with the information and send to 274637. You will recieve a confirmation number and instructions on how to follow up with your reward.